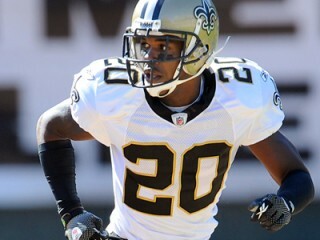 Gay Randall, a key free-agent signing prior to the 2008 season has proven to be a valuable addition to the Saints secondary. The veteran posted a career-high with 65 tackles and was one of the club’s most consistent defenders despite playing through injuries in 2008. In 2009, he appeared in 14 games with seven starts and made 37 tackles, one sack, one interception and six passes defensed as he played in his third Super Bowl as a professional, his second on the winning side. Gay inked a four-year contract with New Orleans after playing for New England for four seasons, where he appeared in six postseason contests, including a pair of Super Bowls. Throughout his career he has been a solid performer in both man-to-man coverage as well as zone defenses. A Louisiana native, Gay has six career interceptions, a forced fumble and three fumble recoveries, returning two fumbles for touchdowns. Signed by Saints to a four-year contract (UFA-NE), 3/4/08; Signed by New England Patriots as an undrafted rookie free agent, 4/29/04. 2009 - Started seven of the 14 games he played in – missing two games due to injury – and made 37 tackles (28 solo) with one sack, one interception and six pass defenses. vs. Detroit (9/13): Saw action as an extra defensive back and made two tackles as well as knocking down a pass. at Philadelphia (9/20): Made five tackles (four solo) in his role as a reserve defensive back. at Buffalo (9/27): Started in the team’s nickel defense and made three tackles. vs. NY Jets (10/4): Notched his first interception as a Saint, picking off QB Mark Sanchez late in the fourth quarter and had two pass defenses. vs. NY Giants (10/18): Made one solo tackle as a reserve defensive back. at Miami (10/25): Played as a reserve defensive back and made two solo tackles. vs. Atlanta (11/2): Made three solo tackles from his nickel back position. vs. Carolina (11/8): Played at nickel back and later filled in for Jabari Greer in the base defense and made two solo tackles with a pass break-up. at St. Louis (11/15): Started at CB in place of an injured Jabari Greer notched three tackles with a pass defense. at Tampa Bay (11/22): Started at cornerback but left the game with a leg injury before he cracked the stat sheet. vs. New England (11/30): Started at CB and made one solo tackle in limited action before leaving with an injury. at Washington (12/6): Missed the game with an injured hamstring. at Atlanta (12/13): Started at CB and made a season-best seven tackles, including a tackle of WR Eric Weems for a 12-yard loss on a run out of the Wildcat formation, along with a pass defense. vs. Dallas (12/19): Started at cornerback but left with an injury before recording any statistics. vs. Tampa Bay (12/27): Missed the game after suffering a concussion against Dallas. at Carolina (1/3): Returned to action as he started at CB and made a season-best eight tackles, including a seven-yard sack of QB Matt Moore. vs. Arizona (1/16 – Divisional Playoff): Had a big game from his nickel back position as he led the secondary with seven tackles (six solo) and made one of the biggest plays of the day, stripping the ball from WR Jerheme Urban in the first quarter that led to the Saints taking their first lead. vs. Minnesota (1/24 – NFC Championship Game): Started in the team’s three-cornerback set and notched a pair of solo tackles in the victory. vs. Indianapolis (2/7 – Super Bowl XLIV): Battled through an illness and made two solo tackles in limited action. 2008 – Started 13 of the 14 games he played..Inactive for two contests, and opened one at nickel corner…Posted a then-career-high seven tackles and knocked away a pair of passes in Saints’ debut vs. Tampa Bay, Sept. 7…Suffered a nagging hamstring injury in the contest that kept him on the inactive list for the next contest. Though he would play in Week Three, he was back on the inactive list for Week Four and did not start upon his return vs. Minnesota, Oct. 6…Back in starting role vs. Oakland and had four stops and three pass defenses…Recorded nine solo stops in win vs. San Diego, Oct. 26…Opened at LCB and had and had six tackles and broke up a career-high five passes at Kansas City, Nov. 16…Had stellar day vs. Green Bay, Nov. 24, recording seven stops, knocking away three passes and notching his first sack on a corner blitz. 2007 – Played in all 16 games for New England, starting three, and had career-high three interceptions…Totaled 33 tackles (30 solo) and also forced a fumble that he recovered and returned for a touchdown…Interception at Cincinnati, Oct. 1, was first since 2004, and added four tackles…Forced a fumble vs. Cleveland, Oct. 7, the scooped it up and raced 15 yards for a touchdown…Second INT of season came at Miami, Oct. 21, with a 31-yard return…Started and posted a season-high eight tackles (five solo) with a forced fumble in 31-20 win over the Jaguars in the AFC Divisional Playoff, Jan. 12...Knocked down two passes against the N.Y. Giants in Super Bowl XLII. 2006 – Played in first three games before being placed on injured reserve on Sept. 27 with a hamstring injury…Made one tackle on defense and another on special teams. 2005 – Played in five games with two starts and recorded 11 tackles (10 solo), a pass defense and three special teams tackles...Placed on injured reserve with an ankle injury, Nov. 15…Was a reserve cornerback and safety in the opener against Oakland, Sept. 8, and had two solo tackles and tied for the team lead with three special teams stops…Started at safety and collected a season-high six tackles (five solo) against Indianapolis, Nov. 7. 2004 – Started nine of 15 games as a rookie and started at left cornerback in all three playoff games...Started more games than any other Patriots rookie and was the lone first-year player to start all three playoff contests...Posted 38 tackles (34 solo) and two interceptions and returned a fumble for a touchdown...Tied for third on the team with 18 tackles (16 solo) in the playoffs...Had first career interception with 10-yard return vs. Miami, Oct. 10…Made his first career start at free safety and tallied two solo tackles and a fumble recovery against N.Y. Jets, Oct. 24…Registered his first career touchdown with a 41-yard fumble return for a score in the third quarter against Cleveland, Dec. 5…Led the team with 11 solo tackles, with a pass defense and a forced fumble in the Patriots’ 24-21 victory over the Eagles in Super Bowl XXXIX. Started 16 of 42 games at LSU, recording 123 tackles (86 solos) with three sacks, six stops behind the line of scrimmage, two interceptions and 28 pass deflections...Finished his senior season with 31 tackles, a pair of sacks, 13 pass defenses and four stops behind the line of scrimmage…Started 11 games as a junior at left cornerback and one contest at free safety, recording a career-high 64 tackles...Played in every game as a sophomore, starting once, and registering two interceptions and a sack... Played in five games as a reserve cornerback as a freshman…Majored in marketing. PERSONAL – Full name: Randall Jerome Gay, Jr….Born in Baton Rouge, La....Nickname is “Blue”...Attended Brusly (La.) HS...Lettered four years in football, three in weight lifting, two in baseball and once in track...Played in only eight games as a senior due to a knee injury but still rushed for 1,067 yards and 13 touchdowns, caught three TD passes and scored on a pair of punt returns...Also caught three touchdown passes and ran back two punts for scores...He and wife, Desha, have a son, Randall III. View the full website biography of Gay Randall.